Discovery of the New Hebrides 200th Anniversary. BRITISH NEW HEBRIDES CONDOMINIUM. Stanley Gibbons Catalogue British New Hebrides 192a. BRITISH NEW HEBRIDES 1952-1980 Colony QEII. Se-tenant Strip of Three. NEW HEBRIDES KEVII Scott 1 SG4 Mint Hinged. Catalog Value £60. 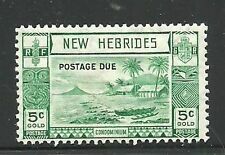 New Hebrides 1965 On.H.M.S. airmail cover used to England. (SG Cat - £54 ). NEW HEBRIDES 1977 CURRENCY CHANGE DEFINITIVE SET SG,222-232 UN-MOUNTED MINT NEVER HINGED NICE AND CLEAN CONDITION. New Hebrides, 1977-78. Islands issue Scott 238-250 set. Mint, OG, NH. NEW HEBRIDES,1977-78. Islands 238-250, Mint. SG F107 (one value). Freedom from Hunger (Campagne Mondiale contre la Faim) 1963. Mint, never hinged. French New Hebrides 1977 set tp 500 francs mint o.g. French New Hebrides 1908 KE VII Complete set SG F1-F5 Mint. French New Hebrides. 1908 KE VII Complete set. 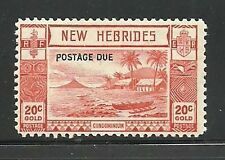 NEW HEBRIDES (P2611B) KE 1D-1/- SG 11-6 MOG. WE WANT YOU TO BE HAPPY. 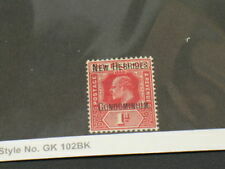 New Hebrides 1923 mystery endorsement. We fill almost 850 orders a month and this is rising. We're 2 retired collectors who do this for fun. We don't make any profit on this, but we can't afford to lose money either. That's what we do and we think it's a good idea. SG Catalogue Price: £ 32 (2017). Condition:Mint never hinged. Fine used. Rest of World (International signed for) - £8.50 . Make Supersized Seem Small. New Hebrides 1924 "Weapons & Idols" 5d on 2½d SURCHARGE INVERTED vfm. SG 42a. 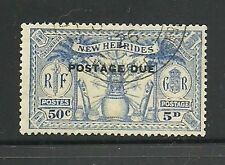 New Hebrides 1924 "Weapons & Idols" 5d on 2½d ultramarine. BPA Certificate (2016). Gibbons # 42a. NEW HEBRIDES 1938 POSTAGE DUES SET SG D6-D10 FINE USED. New Hebrides French 1925 set SGF42/52 MLH/MM - a few minor gum creases but otherwise a fine set. MLH/MM (etc) - a mix of MLH and MM with the majority being MLH. MLH - Mint Light Hinged - lightly hinged no hinge remainders. 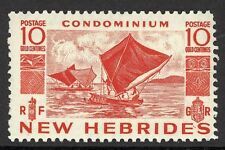 NEW HEBRIDES CONDOMINIUM. 1972 ROYAL SILVER WEDDING. - QUEEN ELIZABETH II.